Salong Crag displays similar climbing to that of the well-known Beacon Hill Crag. It is located in Tai Lam Country Park in the Western New Territories thereby providing a climbing option for people who live in the New Territories. The area consists of two large granite outcrops which are named “Sa” and “Long” boulder, hence the name “Salong” (also it is the names of developer’s son and daughter). There is a mountain stream (bedrock channel), named Kam Sha Stream (金沙坑), which flows from north to south through Kau Keng Shan, entering a catchwater of Tai Lam Chung Reservoir. Most of the rocks here are granites which is solidified from magmas that were intruded near a plate boundary. 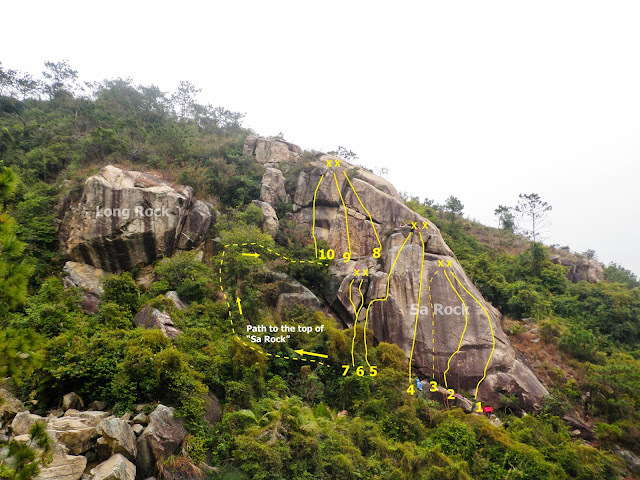 Most of the routes in Salong Crag were originally climbed using traditional protection by the developers and friends. However, now, routes have been equipped with expansion-type bolts and anchors. Top-ropes can be easily arranged by scrambling up from a path to the anchor for Sa Rock, except for Long Rock. Sport routes range from French grade 5 to 8a/b (?) and recommended routes are indicated by a face symbol J to represent better climbing and rock quality (inspired by Francis Haden). All routes in Salong are relatively short, a 40m dynamic rope will serve you well enough here. For climbers who want to setup a top-rope, you should use your own quick draw at the anchor instead of using the ring of the anchor. Also note that you may have to use short sling (0.5m) at the anchor to avoid rope abrasion near the edge. Climbers should also note that insect such as hornet (Vespa mandarinia) are commonly found along the stream channel, extra caution should be taken when you approach the crag. Besides that, wearing a helmet is also highly suggested in this climbing area.